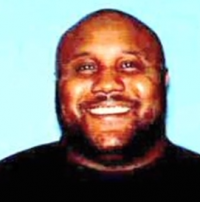 February 9, 2013 (San Diego)--Today the Joint Regional Intelligence Authority issued a bulletin regarding Christopher Dorner, a former Los Angeles Police officer and ex-military member who is believed to have committed multiple murders and also shot police officers in a spree of violence that led him to San Diego late last week. He is considered armed and extremely dangerous. January 17, 2013 (San Diego’s East County)--The second amendment needs to be re-defined for the modern times. It is my notion that the right to bear arms is very similar to the right to smoke; they both have a cancerous effect that contributes to the decay in modern society. We as a society can continue to ignore and look the other way with temporary fixes that give the appearance of seriousness; however, the reality is: there are too many guns in the US; and our too-many-guns are being turned on us. I lay on a crinkly table in a cluttered ER, joking with the doc, bribing him with a promise of homemade shortbread if he could fix my face without leaving scars, looking anywhere but in his eyes, and I noticed a police officer nearby. Read more about WHY DIDN'T SHE JUST LEAVE?